Maybe not my favourite of David’s (NOT DAVE) books, but it was the most telling for me. It was fascinating to note the difference from the start to the finish. How different he was at the start. Still somewhat sarcastic and funny, but I felt that there wasn’t much enjoyment (I guess that’s pretty understandable when you’re sleeping in vomit covered rooms and showering in tubs that have your own vomit in them). A couple of things. It was a lightbulb moment for me when David writes in his diary towards the end about his birthday wish. When he wished for not more…but for less. When he reflects how he can just go and buy what strikes his fancy, whilst in the past he was content with just being able to borrow a book for a library and have a cup of coffee uninterrupted at McDonald’s. I imagine we have all been there. Hopefully we are all in a better place than we were a couple of dozen years ago. I mean that’s how it’s meant to work. You work hard and then you can enjoy and stress less as you’re older….but how nice to remember that you were perfectly able to survive with less and still be happy. Seriously…it was a stop the book for a moment and reflect moment for me. Another thing. Poor Hugh. I mean seriously….Poor poor Hugh. And thank goodness for Hugh. The honesty in David and Hugh’s relationship, in even a few short sentences from a diary entry…well…it’s amazing…and humbling as well. I wonder where David would be if he hadn’t met Hugh. I also wonder where Hugh would be. Talk about two opposites attracting. And the strengths of one complimenting the other…whilst the weaknesses of one smooth the rough edges off the other at the same time. I just imagine a household where there is a lot of eye rolling on both sides! 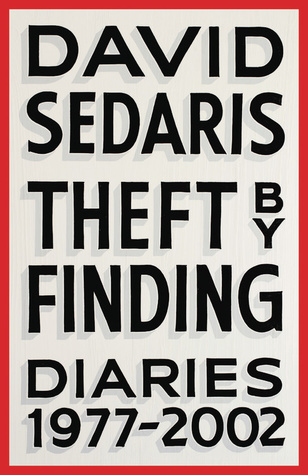 Another thing…I challenge ANYONE to read one of Sedaris’ novels without laughing out loud. I just don’t think it can be done. Finally, when I’ve thought of diaries, or have kept journals in the past, I always imagined they had to have some sort of deep thought process…or that they had to be pages and pages long. Now I know they don’t have to be daily…and they don’t have to be word for word. They can be random. They can be funny. They can be sad. They can be angry. They can be just a single sentence. They don’t have to thought provoking…but funnily enough, a single sentence about an observation of a stranger CAN be though provoking! So glad he published this one. Sure, I’ve read his other books and I know he’s had a substance and alcohol problem…but reading this novel really was an eye opener for what has really made David Sedaris the person that he is today. From social attitudes, how strangers have treated him, from family, to jobs, to being poor, from teaching, from lack of taking control, from a thousand different things that have shaped him…I think I love him even more…as if that was possible…and as only David can make you feel, I at times, absolutely dislike him…but that’s only the social pressure that says you shouldn’t allow people to say some of the things he does out loud….but I can’t help it…his honesty is one of the reasons I love him the most…and how can you stay annoyed at someone whilst at the same time you’re laughing your head off as well?